Frederick W. Mayer was the University Planner for the University of Michigan from 1968 to 2003. He was a Henry Rutgers scholar at Rutgers and a Sears Fellow in City Planning at Cornell, as well as a founding member of the Society for College and University Planning (SCUP), and editor of Planning for Higher Education. He has written numerous articles, authored A Setting for Excellence about the history of the development of the University of Michigan campus, and lectured extensively on the subject of college and university planning. About William Daigneau, APPA Fellow William A. Daigneau is retired from the University of Texas M. D. Anderson Cancer Center, where he served as vice president for operations and Facilities Management. He has written and lectured widely on a number of facilities management topics and has authored chapters for six books on facilities management, as well as numerous articles for professional journals. When one thinks about the quality of the built environment, one tends to think about the layout of the campus and the architecture of the individual buildings. To be sure, this is a significant aspect of the campus setting, but the issue of quality goes well beyond the mere matter of architectural design. The word "campus" derives from the Latin word for "field," indicating a concern with the area between the buildings and the interrelationship between them as opposed to the actual design of the buildings themselves. Over the years, the popular image conjured up by the word "campus" is one of green lawns and tall shade trees surrounding a series of buildings related to one another in a rational manner, all contributing to a harmonious and aesthetically pleasing environment. An attractive environment can be created by careful attention to site design elements, even on an urban campus. However, no matter how great the architectural statements may be, if they are set in a dysfunctional environment, the overall result will be neither efficient nor pleasing. So it is as important to pay attention to the functional and non-architectural elements of campus design as it is to the architecture of the individual buildings. It is to these non-architectural elements of campus design that this chapter is devoted. It attempts to provide the appropriate university decision makers with the information they need to direct the development and operation of a successful system of campus infrastructure. It identifies the issues to be considered when addressing the various areas discussed, and identifies the resources available to solve problems or to develop appropriate proposals for each element of campus infrastructure. The chapter does not attempt to recommend individually best solutions in each area, or to provide a design handbook for professionals undertaking the actual development of the various elements; there is no one right solution. Campuses vary in terms of climatic conditions, campus traditions, organizational patterns, and intellectual philosophies, and the right solution for one campus will not necessarily be the right solution for another. Options always exist, and the best one will vary from place to place. An understanding of the issues involved and the resources available should enable the decision maker to arrive at an intelligent and effective decision for each area that must be addressed. The starting point for the development of any system of campus infrastructure should always be the master plan. This is the document that sets forth the basic guidelines for providing continuity in the overall development of the campus. Specific elements of campus infrastructure must be developed in a manner consistent with the overall objectives of the master plan if they are to contribute to the development of a coherent and operational campus. However, the master plan usually provides only the basic framework and guidelines that must be followed in the development of a system of campus infrastructure; few master plans go into great detail on the design and selection of individual elements. Therefore, many individual decisions will have to be made in developing and implementing an efficient, functional system of campus infrastructure. Another important consideration is the location of the campus and its unique environment. Regional issues must be factored into decisions on the planning and design of the infrastructure. For example, snow removal/storage and ice control is important in some parts of the country, while earthquake design or flood protection is a major factor in other locations. Thus, utility tunnels might be an attractive alternative on one campus but impossible at another. Emergency preparedness in the design of the infrastructure is unique to the particular types of risks a campus might face. The location of cooling towers becomes a different issue for campuses in semi-tropical climes than ones in four-season areas of the country. The selection of hardy, low maintenance landscape materials is quite different depending on geographical location, as well as when it is an urban versus a rural campus. As a result, what is considered a best practice in one part of the country may be quite different in another. Proper consideration of every regional difference would require a book in itself, which is beyond the scope of this BOK. Yet regional factors must be recognized and adopted into the infrastructure plan in order to ensure the campus will operate effectively and efficiently. A good source of regional design practices in through APPA’s regional and state chapters and peer reviews or networking on infrastructure plans is highly recommended. Notwithstanding sustainability and regional factors, the following discussion seeks to identify the major areas of concern that must be faced, to outline some of the key issues relating to each particular area, and to identify resources available to develop appropriate solutions in each case. An efficient and effective system of circulation is an absolute necessity for the proper functioning of any campus. The basic concept for such a circulation system should be spelled out clearly in the master plan. The general elements of vehicular, pedestrian, bicycle, and other circulation systems should be defined in their general principles and established as a basic pattern on which to build. Detailed decisions, however, will have to be made on a day-to-day basis, as various elements of the system need to be implemented, upgraded, expanded, or redone. In attempting to deal with these specific issues, professional assistance should be employed. For example, traffic and parking consultants can provide valuable information in areas such as capacity, utilization, signalization, and general analysis of system problems and solutions. In addition, civil engineers have considerable expertise in the design of roadways, walks, and drainage systems. This system provides access to campus for general vehicular traffic via a regional circulation system and allows it to circulate to major destinations (particularly parking structures and major campus arrival points) via a campus circulation system. It also may be used by service and delivery vehicles and by mass transit vehicles. The system often takes the form of a major peripheral circulation ring, with secondary roads onto the campus to allow access to various major destinations, and establishes walking-time distances from major facilities (see Figure 1). Advances in developing autonomous (driverless) vehicles have the potential to significantly affect campus traffic and parking. These advances should be carefully monitored to determine what adjustment in campus operation and planning should be considered. This system often utilizes the general vehicular system, but it also provides additional designated drives and dock areas to allow delivery and service vehicles to appropriately access the campus. As with delivery and service vehicles, mass transportation often makes use of the general vehicular circulation system, since it is primarily provided by means of buses. However, exclusive bus or pull-off lanes sometimes are employed, as are other forms of mass transportation such as campus or regional shuttle systems. Penetration is crucial for the success of mass transportation systems. When planning for mass transportation, special consideration of congested traffic routes is important since headway times may be significantly affected. One of the most significant aspects of movement on campus is pedestrian flow to and from the campus and between buildings. This is accomplished by a system of pedestrian walkways that both parallel the major roadways and serve interior areas of the campus to connect major destinations such as parking structures and major academic facilities. Specific aspects of walkway design will be addressed later in this chapter. The bicycle is a popular form of transportation on campus and must be accommodated in the circulation system. Bicycle circulation is often combined with either walkway or vehicular circulation systems, through designated lanes or simply by providing additional capacity in the right-of-way. In such cases, conflicts and rules of the road between bicycles and vehicles is an important factor in the planning of such systems. To alleviate these concerns, specifically designated bicycle circulation paths have been created when possible if adequate land is available, and bicycle transportation is treated as a separate circulation system. In addition to automobile parking, consideration must be given to providing appropriate parking for motorcycles and other nontraditional vehicles. Finally, appropriate parking must also be provided for bicycles on the campus. The challenge here concerns the form of storage, the number of spaces required, and their appropriate distribution throughout the campus. Racks, shelters, or lockers are available options, and within the general category of racks, a variety of types are available. In general, the simpler racks are the best, and moving parts should be avoided in exterior use. Racks are most efficiently grouped near building entrances and other destinations where people wish to change from the bicycle mode to the pedestrian mode. But they should be located in areas where there is a high level of safety and security and where the bicycles can be viewed from inside adjoining buildings. The type of parking solution chosen can have a major impact on the character of the campus (see figure 2). There are serious trade-offs involved in the use of land for buildings, parking, or open space and plazas. Nothing can do as much harm to the physical appearance of a campus as a decision to utilize large areas of campus land for surface parking, or to convert small bits of open space to surface parking as demands present themselves. The advent of the driverless vehicle may lead to significant changes in the demand for campus parking. However, it is too early to draw any specific conclusions in this regard. It will be important to monitor any changes which take place as a result of this changing technology so as to anticipate appropriate responses. Open spaces are the natural green spaces where landscape is the dominant element. Open spaces provide the major elements of landscape image that characterize the campus. They can be identified as one of several types. These may be open space preserves around the edge of the campus, arboretums, botanical gardens, gorges, river edges, or other major natural features encompassing the campus. They often are left in a natural state and require less intense maintenance. These are more formal and highly maintained green areas such as the interior of quadrangles, courtyards, or malls that retain a predominantly green and landscaped image. They are often the areas featured in photos and other promotional materials about the campus. These are the playing fields, golf courses, or other forms of natural open space areas used in conjunction with athletic and recreational activities. Plazas are campus open spaces that are subjected to heavy pedestrian traffic and are characterized by more extensive use of hard surfaces. They often are associated with major campus destinations such as the library, the student union, or major academic buildings. Malls are organized along a long, linear, axial pattern and tend to provide structure on many campuses. They may take the form of a landscaped area or a hard-surfaced esplanade, but they serve to provide powerful, organizing spatial elements. Linkages are the smaller spaces that serve to connect the major places on campus. They are often little more than passages between buildings or a minor forecourt to building groupings. Linkages play an important role in maintaining the continuity of visual images between the major spaces and deserve careful treatment in the development of the campus. The specific design of individual campus plazas, major open spaces, or circulation systems is best left to professionals such as planning and landscape architecture firms for the design aspects and civil engineers for the technical aspects. These professionals are well equipped to execute attractive and functional designs for such areas, and their advice should be sought in the design of any major campus space. A number of key issues must be addressed while designing hard surface areas. A wide variety of materials are available, and each has certain characteristics that should be considered. This most elegant of the materials available provides a highly attractive walking surface and works well with traditional architecture, particularly Gothic or Colonial buildings. It is, however, the most expensive of the options and the most difficult to install. Stone requires major care and maintenance, particularly in areas where winter ice and snow is a problem, but it has a long life expectancy. Stone often can be used in conjunction with other materials, such as concrete, to highlight building entrances or major gathering places on the campus. Brick has many of the same characteristics as stone in terms of its attractiveness and compatibility with traditional architecture. It is also a relatively expensive material but, like stone, it can be used effectively in combination with less expensive materials such as concrete. Brick is a relatively long-lasting material and if properly installed will outlast most of the less expensive paving materials. Precast pavers are made of less expensive materials, such as concrete or asphalt, and are shaped to produce attractive patterns that are normally associated with brick or stone paving. They can be obtained in a variety of colors and shapes and tend to be a reasonable compromise between the more elegant brick and stone materials and the less expensive concrete or asphalt. A less expensive material than the modular units referred to above, concrete can be poured in place and positioned in such a way as to achieve relatively good control in terms of drainage and design continuity. Concrete is appropriate in formal campus areas and often is used in conjunction with brick or stone in large paved areas. Like concrete, asphalt is a relatively inexpensive material often used on normal walking surfaces as well as streets and parking lots. Edge control and grading with asphalt is more difficult than with other materials, and this can lead to deterioration at the edges of the walks or drives and uneven drainage. This in turn can cause ponding, which creates unsafe icy conditions in cold climates. Higher quality asphalt paving can be obtained by using edging or curbing and more stringent control measures, but this increases the cost of the installation. Asphalt walks are particularly compatible with natural areas and in less formal areas of the campus. While boardwalks rarely are used except in swampy areas or botanical gardens, wood decking and seating areas often are employed in conjunction with recreation buildings or in housing areas. Treated lumber, which is widely available, makes the cost and life expectancy of wood decks quite attractive. Newer composites made from wood fiber and plastics, as well and 100% plastic decking offers a more expensive but lower maintenance alternative. This is a traditional walkway material in English quadrangles and is sometimes employed on American campuses, particularly in building complexes endeavoring to duplicate the character of English quads. Gravel has a low initial installation cost but often requires a high level of maintenance to keep it looking attractive and free of weeds. Shredded or chipped bark often is employed in natural areas to provide walkways through woodlands, botanical gardens, and arboretums. It also is used in conjunction with playground equipment. It is inexpensive to install but requires constant refurbishing to keep it attractive and functional. Higher initial cost alternatives include recycled rubber products that do not degrade like natural wood, but the recycling of wood waste into landscape mulch is more economical and environmentally friendly. Walkways on college campuses must accommodate large numbers of students utilizing the walks at the same time (the 10-minute break period between classes). The five-foot walk that is common along city streets is not adequate to handle the loads imposed by a campus. An eight-foot walk provides a comfortable minimum width for snow removal in northern climates, but wider walks often are necessary along main circulation routes. The exact dimensions required must be determined on the basis of the individual campus population and movement patterns, but it is important not to undersize walkways on the campus; adjacent lawn areas will bear the brunt of a poor decision. By the same token, roads must be sized to accommodate the vehicular demands placed on them. The appropriate location of walkways and roads on campus is essential in providing access to major campus destinations. Basic guidelines for the placement of walkways and streets should be a part of the master plan, but many minor decisions will need to be made, such as whether to place walks adjacent to the curb or maintain a green planting strip between the walk and the curb. In northern climates, snow removal and where plowed snow will be deposited is also a consideration in placement. These questions should be studied carefully with design professionals to arrive at an appropriate decision for the individual campus. The proper location of walkways and roads has major implications in terms of the overall maintenance impact on the campus, and therefore on the visual appearance. College students tend to take the shortest distance between two points; therefore, walks that intersect with sharp points and narrow angles often result in worn-off corners that provide constant maintenance headaches for the grounds department. Proper design of the walkways should allow for natural pedestrian movement or provide a protective device (such as curbs or seat walls) to separate the walking surface from adjacent landscaped areas. Landscaping should be placed such that clear views in all directions of the intersection are maintained. Proper scoring of walkways and other hard surface areas not only provides attractive patterns and designs for the surfaces themselves, but also is essential to control cracking and settling of the materials. A well-engineered scoring pattern is not only a structural necessity, but also can be designed in an attractive way that enhances the campus. It is extremely important that walkways and roads be properly drained so that people do not have to trudge through mini-lakes on their way from one campus destination to another. This is of particular importance in northern climates where poorly drained areas are likely to freeze in the winter and produce hazardous icy surfaces. Unfortunately, with underground utilities there is no “bury them and forget it!” Steam lines leak, sewer lines collapse, and water lines break, and all of them someday reach full capacity. When planning the campus infrastructure, some thought must be given to the routing of underground utilities, keeping in mind that they eventually will have to be repaired, enlarged, or replaced. An essential part of any campus master plan must be the utilities master plan, which lays out a logical pathway around and through a campus to supply existing and future buildings with electrical, telecommunications, chilled water, steam, water, gas, and storm and sanitary sewer systems. Creation of these pathways, or grid, should consider such things as maintaining campus access to buildings and other facilities when the time comes to repair or replace the buried systems. Often such failures come at the most inopportune times, so important spaces such as a lawn used for commencement, while convenient for placement of utilities, may prove to be disastrous if the utility fails two days before graduation ceremonies! Thorough planning in the placement of underground utilities can avoid major inconvenience, unnecessarily high repair costs, lost revenues, and broken hearts. Following is a review of the major underground utility systems and the characteristics to consider in their placement. Utility corridors. Development of a utility grid with designated corridors for utility placement organizes a campus and helps guide decisions on building expansion or new construction. Such corridors should follow streets or access drives, a practice found in most towns and cities for municipal utilities. Such corridors should optimally run parallel but outside the paved street or drive, unless consideration has been given to how traffic would be detoured during major utility repairs or reconstruction. Designating a 5- to 10-foot strip on either side of a paved roadway is recommended, allowing room for sidewalks and lawn. However, the placement of street trees should be considered to avoid the utility lines, because trees do grow and no one likes to see a mature tree cut down. If use of the paved area is necessary, lines should be kept to one side or the other. Parking lots, recreation fields, important gathering spaces, and the underside of building foundations should be used only when there is no other feasible alternative. Sewer Systems. Unlike many of the other systems, sewers are typically nonpressurized, gravity flow systems. Thus topography largely dictates placement of sewer mains and collectors. However, with some creative thinking even sewers can be developed along a logical grid, intercepting the major lines to municipal or campus treatment facilities or storm outfalls. Over time, two major issues arise with sewers: they collapse or reach their original design capacity. Thus sewers, manholes, and collection vaults should be placed where large and deep excavations are possible and are least disruptive to campus operation. Many campus sanitary sewer lines were originally located to minimize the length of runs and to maintain slope for adequate flow and minimize clogging. In some cases, as campuses expanded, lift stations were necessary to regain elevation to major sewer mains. Depending on the topography of the site and the elevation of the main sewer interceptors, it may be possible to develop a future collection grid that eliminates or minimizes the reliance on lift stations. Storm sewers, since they normally collect surface run-off as well as roof drains, usually follow roadway systems. Under severe rainfall, it is not unusual for stormwater systems to reach capacity for a short period of time, thus surcharging and pressurizing the system. This results in backflow that may evidence itself in building flooding, street flooding, or, if improperly interconnected with sanitary lines, through building floor drains. Thus proper design and sizing of collection mains as well as use of retention/detention systems must be carefully considered. Electrical Systems. Four aspects of campus electrical distribution need to be considered when planning the electrical grid: cable routing, substations, transformers, and emergency generators. High-voltage distribution cable routing is not constrained by elevation, like sewer systems, but it does have unique requirements. Electrical cable should not be next to other underground utilities because of the hazards associated with cable failure or nearby excavation. Thus, while it may be placed in a utility corridor, sufficient spacing from other utilities is necessary. Furthermore, the cable needs to be clearly identified, either with locator tape or utility maps. The creation of loops or secondary circuits to serve critical facilities should be planned, such as for hospitals, data centers, research buildings, and other facilities demanding fully redundant service. Substations are essential but often unsightly, so their location requires some careful consideration. Today the substation is at the edge of campus; tomorrow it could be at its center. Therefore, as part of the master planning effort, plans for current and future locations should be developed in conjunction with the local electrical utility company. Step-down transformers may be located inside a building, in a vault, or adjacent to the building on a pad. For various safety and maintenance reasons, primarily fire/explosion (although rare) or replacement, it is preferable to locate transformers outside, which creates its own set of requirements. First, access, especially under emergency conditions, should be planned for. This access should consider large flatbed trucks and hydraulic crane placement to lift and set a transformer. In addition, screening of the transformer using building orientation, enclosures, or landscaping will be required. Thoughtful advance planning can help these installations “vanish” from view. The last aspect of electrical systems is the provision of emergency generation. The location of these is often thought about only when a new building is under design, and then many unforeseen problems may arise. Generators require supply air, are loud, and produce exhaust gases, often with an odor if they are diesel-fired. Advance planning can avoid potential problems by considering prevailing winds, adjacent building orientation and heights, fresh air intakes, pedestrian walkways and green areas, and so on. Opportunities to size emergency generation capacity for multiple buildings can also be considered when planning for future development of a campus. Telecommunication Networks. Low-voltage cable, optical fiber, and wireless networks fuel today’s information technology, well beyond the traditional telephone circuit. 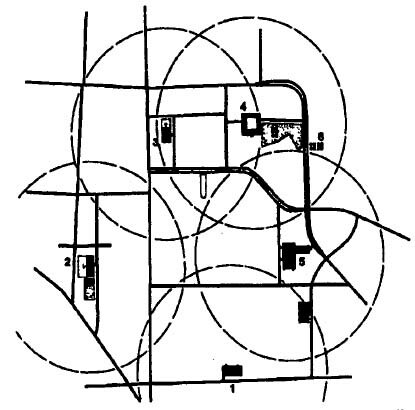 Since modern telecommunication systems were never planned for in master plans, a satellite x-ray of most any campus would reveal a spider web of cables, fiber, and antennas. But it is never too late to develop a cable plant and wireless network master plan. Since cable is always being upgraded with newer requirements and improved bandwidth, the consolidation of the underground cable ducts should be planned for. Again, looped or redundant cable feeds are important since many building automation, fire alarm, and security systems now run on campus data networks. In similar fashion, radio and wireless coverage planning can help identify optimal and unobtrusive antenna placement as well as equipment room locations. Chilled Water. Central chilled water plants, or interconnected building chillers, are often an efficient way to cool campus buildings. Underground chilled water distribution systems are pressurized, but routing and elevation change can influence pump sizing and overall system efficiency. In addition, looping the system provides redundancy in the case of piping failures or routine valve station maintenance. In planning for chilled water, consideration should be given to routing, valve vault locations, disruption due to piping failures, and system sizing to accommodate future growth, during either initial installation or the construction of future upgrades. Unlike steam systems, insulation repair and maintenance is a less critical factor in that the lower temperature differential between the chilled water and the surrounding soil makes it more durable. Steam and Pressurized Hot Water. Central heating plants have long been employed on college campuses due to the proximate location of a large number of buildings. The resulting distribution systems are often direct buried or placed in utility tunnels. The tunnels are often quite expensive, so proper placement and routing is important to minimize costs. However, maintenance of insulation and valves, and upgrading of capacity for future growth is greatly simplified. The chief factor in maintenance is not the steam piping, which is normally quite long lived, but the condensate piping, owing to the caustic chemistry of condensate (which is avoided in pressurized hot water systems). Therefore regular maintenance and future piping replacement must be planned for. This maintenance requirement is amplified if the steam and condensate piping is direct buried. In this case not only must the piping and associated valve pits be maintained, but the surrounding insulation as well. Water saturation of insulation materially reduces its efficiency, leading to piping corrosion and ground heating, which will kill all adjacent vegetation. Excavations around direct bury heating pipes should be seriously considered when planning the placement of these systems. Gas. Natural gas lines rarely leak but when they do, the result can be quite “explosive.” Gas lines are one of the few utilities where placement under paved areas is permissible and may be desirable if properly marked. Since gas mains are pressurized, they may be run parallel to other pressurized lines such as water mains. However, some distance should be maintained from utilities that may require more common excavation (steam) or sewer lines, especially sanitary. Nonpressurized mains can provide a conduit for leaking gas, routing them to building locations where they may be trapped and possibly ignited. Domestic Water. Water mains serving a campus, like some other utilities, are best if looped and sized liberally for future growth. However, unlike other utilities, they are more prone to leaks because of the dynamics of pumping long distances from wells or reservoirs. It is important to maintain water pressure for fire safety. Because of these characteristics, large swings in water pressure are common, often leading to over-pressurization that causes old lines, valves, and joints to fail. So it’s not a question of if water mains will spring a leak, but when, and it usually happens at the worst possible times. While water mains may be placed near paved roadways, they should be placed on one side or the other so that excavation for repair can be performed without closing the entire roadway. Where water mains cross important intersections or other utilities, buildings, and tunnels, the risk of leaks can be managed by sleeving the line. In designing the best routes for water mains, remember that minor leaks can quickly grow into a major one, undermining or destabilizing surrounding soil that other utility lines or foundations rely on for their support. Irrigation. Traditional irrigation systems have used potable water sources. However, increasingly, the use of collected rain or grey water is being used to conserve water. In order to use this resource, holding tanks and cisterns, must be constructed, and the water held by them must be piped to the areas requiring irrigation. A well-planned system for both collecting and distributing the water can be developed as part of overall infrastructure plan. However, special precautions must be exercised to route and clearly mark grey water irrigation systems to prevent inadvertent cross-connection with domestic water supplies. Looking Ahead. In an era of rapid technological advancement, innovations in sustainable energy, water, waste, and telecommunications are reshaping how we design and use campus buildings. This will certainly affect future decisions on campus utilities. Wireless transmission of voice and data is now commonplace but this same technology may apply to electrical power transmission in the future. Heating and cooling of campus facilities using new and different technologies such as solar, wind or geothermal sources directly affect utility sizing and distribution decisions. Water supply and sewage systems must now be considered in light of storm water retention, groundwater recharging, the use of gray water for irrigation and other non-potable water purposes, and newer treatment technologies such as desalinization of sea water. The planning of campus utility systems must now be cognizant of such changes in technology and policy and prudent strategies developed to accommodate this continuing evolution. No other single element plays as important a role in the development of a positive campus image as the landscape. Mature trees and well-maintained lawns provide a sense of permanence and quality. Plants are invaluable on campus because of their attractiveness and because they often can solve design problems more easily and less expensively than architectural solutions. Trees and lawns should be employed whenever possible since their use is flexible and they have comparatively low maintenance and natural aesthetic value. Maintenance. Plants should be chosen for minimum maintenance. Zones can be established so that high-visibility areas receive more intensive maintenance than low-visibility areas. Careful consideration must be given to the type of maintenance appropriate for each plant species. Proper plant selection and design can significantly reduce maintenance and the use of native species is highly recommended. Physical Conditions. Careful consideration of the soil and climatic conditions is necessary in the selection of plant species. Species prone to disease or insects should be avoided or used sparingly. Security. Issues of security must be considered in any planting design. Visual access should be maintained in areas immediately adjacent to circulation routes, and large masses of tall evergreens in housing areas can cause problems. Circulation. Movement can be regulated, reinforced, and clarified with vegetation. Microclimate. When used correctly, vegetation helps regulate wind, create shade, decrease runoff, and establish "sun pockets." Aesthetics. The general appearance of the campus can be greatly improved by the appropriate use of plant materials in the institutional setting. The best effects are achieved when plants are used with boldness and simplicity. When chosen for form and seasonal color, plants enhance year-round interest and appeal. Education. Whether established separately or incorporated into the overall campus landscape, an arboretum on campus provides plant specimens for study and research and for attracting wildlife. Historical Context. Vegetation used on campus provides historical associations. The history of the campus or the region can be recalled by preserving remnants of groves and mature or historically significant trees, and by using native plant materials. Plantings also may be used as memorials to significant people or events in the institution's history. Various plant types, such as deciduous and evergreen tress and shrubs, ground covers, and vines (except on building exteriors), are suitable for different areas and can be used to perform specific functions on campus. Careful consideration should be given to the intent of any new planting. The plant type should then be carefully chosen. When selecting plant materials, native species are best suited for long-term vitality and reduced on-going maintenance costs. In addition, the possible introduction of invasive species is avoided as well as diseases and pests destructive to native plants. Deciduous trees, together with buildings, should provide the framework for the campus image. While other elements die or are removed, deciduous trees and architecture age gracefully, providing continuity in the design. Deciduous trees have a transparency at eye level, which emphasizes spatial continuity and conveys a human scale. Careful spacing can express the character of the site and impart a consistency between the tree pattern and the surrounding order. Deciduous hardwood species can be used throughout the campus wherever physical conditions (soil and drainage) meet their requirements. Evergreen trees can live as long as deciduous trees but function differently in a design. They have an opaqueness rather than transparency at eye level, which makes them more useful as backdrops to other features or as focal points. They function well in groups at the edge of campus where their stiff forms can be appreciated from a distance, and where they will not create dense shade and security problems. They provide winter color and, when used among several rows of vegetation, are valuable as part of a windbreak. They also can be used to screen unattractive views or features. Shrubs can be used to organize pedestrian routes and play a supporting role for trees in campus design. From both a maintenance and safety standpoint, shrubs work best in masses or hedges rather than as individual specimens. Dwarf shrubs eliminate many pruning and security problems, while larger ones can be used in much the same way as dwarf trees to provide scale, fragrance, and seasonal color. Flowers provide a highly attractive splash of color that is greatly appreciated by students, staff, and visitors. Annuals may require complicated and continuous maintenance to keep from looking neglected; perennials require less continuous care and only need to be divided occasionally for optimum growth. Many perennials are taller than annuals, and often are more suitable for larger institutional settings because they are more noticeable from circulation routes. Annuals can be used in front of the taller perennials and in large planters (5 to 10 feet long) for the greatest visual impact. These should, however, be concentrated in a few highly visible areas to minimize maintenance. The use of mulch in these areas will also decrease maintenance. Grass is the best ground cover for general use on campus. Modern mowing equipment makes it unnecessary to replace grass with other ground cover species in most areas. Allowing grass and wildflowers to grow tall in wet or swampy areas reduces maintenance and the need for costly drainage systems while adding variety and color to the landscape. When allowed to evolve naturally, these areas also attract wildlife and are valuable for use by the academic units as a teaching and research tool. Broadleaf evergreen ground covers are best planted in deeply shaded areas where grass will not grow and in raised planters or under trees, where they will add color and interest, and eventually reduce the need for weeding. They also can be useful on slopes too steep for mowing. Invasive ground covers such as crownvetch should be limited to remote areas such as drainage ditches, where they can spread without crowding out other desirable vegetation. Vines are commonly associated with a college image. Traditionally they were used to cover large unbroken expanses of masonry and brick or to unify incompatible styles of architecture and building materials by providing consistency of color and texture. More recently non-clinging vines are used as ground covers. Vines require constant pruning, which should be considered in their use, and some vines are invasive. Clinging vines on building exteriors will accelerate the deterioration of masonry, so they should only be used on trellises or fences adjacent to building facades. Careful consideration should be given to the appropriateness of any new design. Many plant species used in a residential design are not appropriate in an institutional setting because of their small size, short life spans requiring frequent replacement, disease susceptibility, and high maintenance requirements. Though attractive, annuals commonly are overused on campus. They are short-lived and often too small for the campus setting. Annuals also require vast amounts of intensive maintenance time (planting, watering, weeding, and fertilizing) that could be better spent on more valuable vegetation such as trees. When correctly chosen, perennials are a viable alternative because of their larger size and easier care. Structures such as railroad ties and oak barrels, which look attractive at home, are too informal and visually inappropriate for the formal campus setting. Trained landscape architects and horticulturists are an invaluable resource in planning and maintaining the campus landscape and should be a part of any design team that deals with the university grounds and landscape. One of the major design challenges facing the university is how to create a consistent image for the campus--a design continuity that ties together the various parts of the campus and that distinguishes it as a unique element within its larger community environment. Considerable attention has been focused on how some of the major building blocks of the campus can be utilized to further this overall environmental design objective. Subjects such as continuity of architectural style or materials and of landscape elements have been examined in great detail by both professionals and laypersons that are involved in the overall development of the campus. Less attention, however, has been given to the smaller elements of "campus furniture" that are necessary for the proper functioning of all campuses but that all too often are acquired and placed in an uncoordinated, haphazard fashion. Items such as waste receptacles, benches, and lighting standards often contribute not to a sense of design harmony on the campus, but rather to a sense of aesthetic chaos. Many campuses have endeavored to tackle this problem by developing a unified system of campus furniture based on well-formulated design criteria. The nature of materials utilized and the design solutions selected vary from campus to campus depending on differences in climatic conditions, student lifestyle, campus traditions, budget, and maintenance requirements. But the existence of a conscientiously developed, well-designed system of campus furniture is of great importance. Again, the starting point for the development of any system of campus furniture should be the master plan. This document will set forth general campus design objectives that should be applied in selecting individual elements of campus furniture. It should address the crucial subject of how the elements should be placed on the campus and related to other design elements, such as buildings, walks, and roads. The predominant architectural material on the campus or the architectural style may influence the choice of individual items of campus furniture, as will external elements such as walkways and plazas, tree masses, and open space. This fact can be capitalized upon and strengthened by the development of unified, campus-wide systems of outdoor lighting, signage and graphics, and campus furniture and detailing. Accepting the basic master plan objectives, the university and its retained consultants can proceed to identify the performance characteristics required of the elements to be used on the campus and to develop designs that embody these basic characteristics. One important characteristic may be that the units must lend themselves to a program of implementation to be carried out incrementally over a period of years. Others may include such things as durability (particularly in harsh climates), stability, cost, low maintenance, resistance to vandalism, and attractiveness. By applying these basic criteria and respecting the basic objectives set forth in the master plan, it should be possible to identify a system of campus furniture appropriate for each individual institution. All of these and any similar objects on campus should be included as part of a comprehensive, integrated system of campus furniture. For people to use a campus effectively, they must be able to find their way, first to the campus itself and then to various destinations within it. To accomplish this, it is necessary to create a system of way-finding with appropriate signage at several levels. In addition to way-finding signs, a variety of regulatory and warning signs also are necessary. These include stop signs, no parking signs, and fire zone signs. They are often dictated by federal and state traffic control manuals that must be followed to secure appropriate enforcement from law enforcement and judicial agencies. One last category of signage and graphics to be considered concerns formal and informal facilities to allow students, faculty, and other appropriate groups to present messages about meetings, events, and activities to the campus community. Such facilities can include kiosks or public bulletin boards for the informal posting of notices, posters, and handbills; designated locations for temporary signs; formal advertising billboards; display boards that can be used by campus theater, lecture, and musical organizations in a more formal manner; and other devices such as banners and flags that can be employed by various campus and student organizations. Each of these elements should be thought out carefully and planned so that appropriate facilities will be provided for legitimate informational requirements in a way that enhances the aesthetic character of the campus and reduces maintenance problems. If posting of notices and information is allowed to take place in a haphazard or scattered manner, it can be extremely detrimental to the appearance of the campus and, taken to its worst extreme, it can constitute nothing more than campus graffiti. When designing a system of campus way-finding and graphics, some basic principles should be kept in mind. Hierarchy. A logical progression of signs is essential to effective way-finding. Campus Orientation. This should be provided through the use of "You Are Here" maps or verbal messages. Branding & Consistency. High-quality materials and uniform colors and type styles should be used throughout the campus. The use of a graphic standard for signage helps establish and reinforce the brand image of an institution. Involvement with marketing or public affairs staff in signage design is therefore an important factor. Visibility. Signs should not be visually obstructed by vegetation or other objects and should have adequate lighting for night viewing. Placement. Signs that are located inappropriately can present an obstacle or a hazard. Signage should be placed an adequate distance from the road or path and high enough off the ground so that it does not interfere with traffic. Message Length. Informational overload can be avoided by providing only vital, concise information on signs. A successful signage system meets the needs of its users with clarity and strategic placement. It can make a first-time experience or a daily routine hassle-free. A well-designed system of exterior lighting is essential to the safe use of the campus after dark. In addition, lighting fixtures affect the appearance of the campus both during the day and at night, and may affect surrounding residential and business areas in the evening. Therefore, careful design of the campus lighting system is essential. Electrical engineers and lighting consultants have detailed expertise in this field and should be employed to develop the lighting system for the campus. In addition, if lighting is to be supplied by a local utility rather than by the university itself, the fixtures will have to conform to the standards established by the utility company. Many types of lighting fixtures are employed on the typical campus. Roadway lighting. Provides well-lighted pathways for vehicular circulation and adjacent pedestrian walkways. Pedestrian lighting. Provides clear visibility and security along campus walkways. Athletic field lighting. Allows for extended use of recreation facilities during evening hours. Great care should be taken in selecting athletic field fixtures to ensure that the relatively high levels of light required for these facilities are directed primarily at the playing area and do not spill into adjoining residential areas. In addition, the appearance of such fixtures during the day when they are not in use often is unsightly and can have a negative impact on the overall campus. Well-designed exterior athletic-field lighting is available and, if care is taken in the selection of the fixtures, can be employed on the campus in a way that meets the requirements of recreation field users without harming the aesthetics of the campus or the surrounding area. Landscape lighting. Special lighting to highlight landscape features, such as flowerbeds, attractive trees, fountains, and artwork, often is used on campus for special effects. This has a secondary benefit of increasing security and visibility on the campus. Architectural lighting. It is common on campuses to highlight the face of prominent buildings or architectural features such as towers and clocks. Again, this enhances the aesthetic appearance of the campus and assists in security. Security lighting. In some areas, such as plant department complexes, service areas, or less visible campus areas, there may be a need for simple security lighting. This can be provided from building-mounted fixtures designed primarily to illuminate the area surrounding a building with relatively little concern for the fixtures' aesthetic impact. This type of fixture should be employed with great care and only in areas of a utilitarian, functional nature where its impact on the overall campus will not be detrimental. In the present era of security concerns, the philosophy of lighting is changing from lighting the pathways to maintaining a minimum level of illumination throughout the entire zone. This trend has led to other issues such as "light pollution" in the sky and surrounding neighborhoods. It has also directly affected sustainability when considering total campus energy use. In view of this fact, most campuses may need to reexamine their current lighting policies, equipment selection, and placement design with the aid of a qualified lighting consultant. To keep the campus clean, attractive, and free of litter, it is essential that an effective system of trash collection and removal be developed. Such a system will contain a number of elements. Receptacles should be placed near major walkway intersections, plazas, food centers, and building entrances. They should be located for convenient use, but should be as visually unobtrusive as possible. The design of these receptacles should be attractive and compatible with the overall design framework of the campus, but they should be built in a sturdy manner that will stand up to the rugged wear and tear they will receive in outdoor campus use. These receptacles come in both round and rectangular shapes. The round ones lend themselves to being tipped over and rolled about campus as a student prank. With the advent of the smoke-free environment movement, it is becoming necessary to provide smoking urns at building entrances and at other designated locations on the campus to allow for the extinguishing of cigarettes, cigars, and pipes before entering university buildings. These urns should be designed in a manner that is compatible with the rest of the outdoor furniture employed on the campus but as with trash receptacles, they should be of a sturdy construction that can withstand the heavy use they will receive. For campuses that ban smoking in all buildings and grounds, placement of urns near parking areas and at major entryways will help alleviate litter and the transport of cigarette butts into storm water drainage systems. In areas of heavy use where constant emptying of small containers becomes a maintenance problem, it may be necessary to build larger trash receptacles that can hold greater volumes of refuse. These should be designed in a way that will be compatible with the other elements of campus refuse collection and outdoor furniture. These elements commonly are employed throughout campuses to allow for the collection and disposal of waste materials from inside the individual buildings. Typically, they are large and relatively unattractive units that if placed adjacent to each building on the campus can have a negative aesthetic impact. Wherever possible, dumpsters and compactors should be designed into the architecture of the building so as to provide as little impact on the campus as possible. When such integration is not possible, effective screening via screen walls, berms, or plants should be provided to reduce the negative impact. With the current interest in recycling, containers for collecting recyclable materials have appeared on many campuses. The same guidelines for the design and placement of these containers should be applied as for the other facilities for waste collection and removal. The overall appearance of the campus can be enhanced greatly by the addition of various design elements to mark the focal point of major campus spaces or simply to provide an attractive embellishment to the campus. The use of water in an artistic manner on the campus can provide visual and auditory delight. Such adornments are used widely on U.S. campuses and are particularly appropriate in warmer climates where concerns about freezing and thawing do not exist. Often collected by various academic departments, these can be used in ways that enhance the design of the campus. Boulders used by the geology department as instructional media, obelisks or other elements collected by the archaeology department, memorial benches, and other such items can be placed in such a way as to contribute to the overall appearance of the campus. Various classes or individuals may wish to memorialize an individual, group, or event by constructing various elements on campus or installing memorial plaques. Again, if properly designed, these memorials can contribute to the attractive character of the campus. By far the most instructive and enriching element that can be added to the campus is fine art. This can be done on either an individual building-by-building basis (where donors are available) or by assembling collections of art, such as the Murphy Sculpture Garden at UCLA. Numerous campuses have undertaken highly successful programs of this nature. In states that have enacted a "1-percent-for-art" program, these funds have been extremely influential in bringing fine art to the campus. The introduction of fine art into the campus not only enhances the visual character of the environment, but also provides an instructive day-to-day experience for students. The maintenance and restoration of works of art is a highly specialized and skilled profession. Work of this nature is best left to trained and experienced outside professionals rather than attempting to do it with in-house staff. The permanently or temporarily disabled deserve special consideration on campus. At some time, many of us will experience a temporary physical impairment necessitating crutches or a wheelchair. The needs of the hearing and visually impaired and persons with emotional or learning disabilities must be considered as well. Even baby strollers require curb cuts and ramps. It is important to plan for all these groups in order to facilitate their movement on campus. Physical Dimensions. Standard dimensions are required for ramps, walkways, doorways, halls, and parking spaces that are to be used by those with physical disabilities. Convenient Access. Access should be considered between buildings and parking areas. Convenient access must be facilitated to important parts of the campus. Sensory Cues. Cues must be provided for the visually and physically impaired. Blind persons rely on tactile cues such as paving, grade changes, and braille signs; auditory cues such as street sounds; and olfactory cues such as plant aromas. The physically impaired, including those in wheelchairs, need cues located where they can see them. Signs must be low enough to read from a wheelchair, and building entries and alternate routes must be marked clearly. Planning for students, faculty, staff, and visitors with special needs is not merely a matter of traveling around campus and looking for places where curb cuts are needed. Such decisions should be approached systematically and comprehensively and should always allow input of the users who best understand their physical limitations and requirements. The boundary where the campus and the community meet is an extremely important one, both in terms of the overall image of the campus and the nature of the relationship between the campus and the host community. The form this boundary takes depends upon the nature of its origin and the manner of its growth. Urban universities often began on a small parcel of land and expanded on a parcel-by-parcel basis so that their boundary is relatively indistinguishable from the surrounding community. 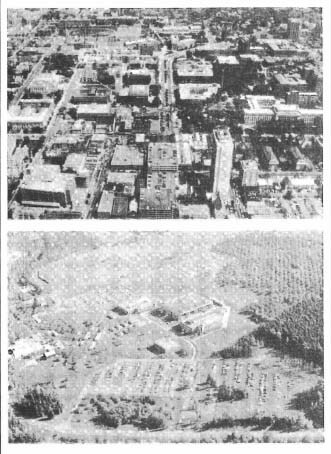 Land-grant institutions, on the other hand, often were given large expanses of land that enabled them to develop a greenbelt surrounding the campus. Of course, some urban universities benefited from sizable initial land acquisitions and have developed a well-defined, attractive campus in the heart of the community. The exact form of the boundary, however, is less important than the image it conveys. Some universities have chosen to construct buildings in such a way as to create a fortress-like wall, thereby saying, "keep out" to the community. Unfortunately some have created a wasteland of pavement and parked cars that create an unattractive barrier between the campus and the community. Others have achieved a similar separation, but by means of a landscaped green belt that relates in a more pleasant and inviting way to the surrounding neighborhood. Other campuses have surrounded themselves with low, nonthreatening walls that do not send a negative message to the neighborhood, and still others have chosen to keep their boundaries loosely defined so that the campus and the neighborhood blend together. A number of successful solutions have been devised utilizing a combination of these approaches. The goal is to create an image of positive interaction between the campus and the community while establishing an identity for the campus. Thus, the identity of the campus can be preserved in a way that the community perceives as inviting rather than hostile. In addition to the areas already covered in this section, other issues may present themselves on a given campus. Issues such as the presence of overhead wires and what to do about them, or the necessity to screen unsightly or inappropriate elements on the campus such as pad mount transformers, cooling towers, and outdoor storage areas may present themselves from time to time. It is impossible in one chapter to cover every contingency. However, it is clear that whatever issue of campus infrastructure may arise, it is important to develop a well-conceived and integrated solution that conforms to the overall objectives of the master plan and that is consistent with the other elements of campus infrastructure. The talent to solve these problems is available through various consultants and in-house professionals. If decision makers keep this objective clearly in mind, the result can be an attractive and well-integrated system of campus infrastructure that serves to enhance the overall appearance of the campus. The final challenge as the campus attains the environmental and aesthetic qualities it seeks will be that of preserving a quality environment in the face of various day-to-day pressures. Developing methods to keep university vehicles, contractors, outside vendors, and others from abusing the landscaped areas or misusing the walkways is critical. The ongoing operation of the campus must become oriented to respecting the environmental qualities that have been created and to preserving and enhancing them as the campus continues to grow and develop. The importance and interrelationship of campus infrastructure can be overlooked easily in the design of the campus, but its importance should not be underestimated. For a campus to project a clear, unified image, the introduction of any new elements into the environment from buildings to trash receptacles must be viewed in the context of the existing campus and the master plan for future development. By repeating materials, forms, scale, and other characteristics, many aesthetic and functional problems can be solved and a unified image for the campus created. People are most aware of the elements they come in close contact with. This is why attention to detail is so critical in the design of a campus environment. Efforts and resources expended upon the development of an integrated system of campus infrastructure will pay benefits not only in terms of the aesthetic and psychological impact on those who come in contact with the campus, but also in the functional and operational aspects of the institution. Finally, the design and maintenance of the campus infrastructure must be integrated into the overall sustainability effort. The environmental impact of chemical use (pesticides, fertilizers, de-icing chemicals, etc. ), traffic congestion, energy use, light pollution, invasive species, runoff, and water use, as well as many other issues, must be considered in the planning of the campus infrastructure. 1. The material presented in the sections "Landscape," "Way-Finding and Signage," and "Accommodating Persons With Disabilities" is drawn from a report titled "Campus: A Compendium of Planning and Design," prepared by the State University of New York Environmental Improvement Program, 1988. Calori, Chris. 2007. Signage and Wayfinding Design: A Complete Guide to Creating Environmental Graphic Design Systems. Hoboken, New Jersey: John Wiley & Sons. Crankshaw, Ned. 2009. Creating Vibrant Public Spaces: Streetscape Design in Commercial and Historic Districts. Washington, DC: Island Press. Dober, Richard. 2000. Campus Landscape. New York: John Wiley & Sons. Dober, Richard. 1963. Campus Planning. New York: Van Nostrand Reinhold Co.; 2nd Edition, 2000 by the Society for College and University Planning. Simonds, J. O. 2006. Landscape Architecture, 4th Edition. New York: McGraw-Hill. Urban Land Institute, National Parking Association. 2014. Dimensions of Parking, 5th Edition. Washington DC: The Urban Land Institute.